Now when He got into a boat, His disciples followed Him. And suddenly a great tempest arose on the sea, so that the boat was covered with the waves. But He was asleep. Then His disciples came to Him and awoke Him, saying, “Lord, save us! We are perishing!” But He said to them, “Why are you fearful, O you of little faith?” Then He arose and rebuked the winds and the sea, and there was a great calm. So the men marveled, saying, “Who can this be, that even the winds and the sea obey Him?” Matthew 8:23-27. When you are with Jesus you are safe and secure, no matter how bad things may appear to be. You see waves pouring over the side of the boat. The lake so peaceful and calm a couple of hours earlier was whipped into such rough condition that no boat was safe in its waters. The Sea of Galilee is about thirteen miles long and eight miles wide. That’s plenty big enough to produce waves that will swamp a small boat. What you see is waves that are higher than the sides of the boat and are crashing down into the boat so that the boat is being filled with water. We live our lives in these bodies God has given to us. He gives us our senses. He preserves them. We learn to depend on what we see, touch, taste, smell, and hear. When we see waves flooding into the boat, feel the cold water rising up from our ankles to our calves, taste it on our lips, smell the sea smell, and hear the wind roaring in our ears we know, on the basis of the senses God gave us, that we are going to drown. If you cannot rely on your senses and on the basis of what you see, touch, taste, smell, and hear come to reasonable conclusions about your condition and safety, you cannot take care of yourself. When it comes to our bodily needs we need to understand cause and effect. God gave us our senses and he gave us the ability to reason. We are not animals. We don’t do what we do by irrational instinct. We control our bodies, our emotions, our actions, and the words we speak. We exercise self-discipline. Among the fruit of the spirit listed by St. Paul in Galatians 5, the last one listed in self-control. God has blessed us with sensory and intellectual faculties that enable us to exercise self-control. Who are those for whom everything works together for good? Who are those whom God foreknew, predestined, called, justified, and glorified? 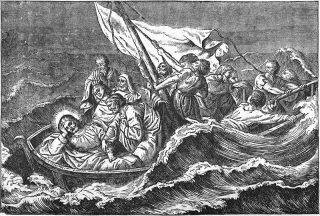 They are those in the storm-tossed boat about to be swamped in the middle of the sea with Jesus sleeping in the back of the boat. Everything depends on Jesus. Everything depends on being in the boat with Jesus. They are in the boat. Jesus is in the boat. That’s why we go to church, read our Bible, attend Bible class, join with other Christians to hear the gospel proclaimed, to eat and drink Christ’s body and blood, to sing praises to God in the hymns of the church. Where the means of grace – the pure gospel and sacraments – are, there is Christ. Where Christ is, there we are safe. There we cannot suffer harm. There is peace, security, and everlasting life. Christians are easily conned. It’s not that we have no faith. We believe. It’s that we have little faith. Christ’s disciples weren’t faithless. They ran to Jesus when they saw that they were about to drown. They cried out to Jesus for help. They asked Jesus to save them. That’s faith. It’s not unbelief. But they had such little faith. They were afraid. They should not have been afraid. They should have been confident in their safety. After all, Jesus was there. What harm could come to them if Jesus is there? What harm can come to us? The storm on the Sea of Galilee was a foretaste of what was to come. They would be threatened, not just by the natural elements, but by people. 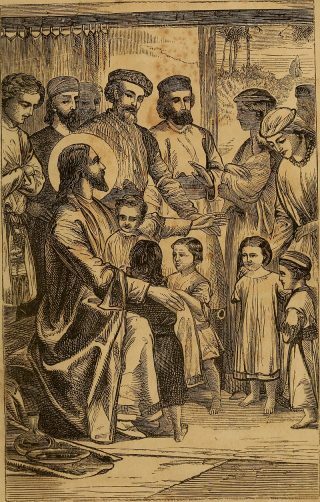 They would face persecution from the world, from the religious leaders, from their own families. The suffering they would face would not destroy them. God would preserve them. He would give them the words to say. He would protect every hair on their head. The power of Jesus lies under the cover of apparent weakness. I say apparent, because that’s what it appears to be. He’s a man sound asleep in the back of the boat, oblivious to what is going on around him. That’s how it appears. That’s what we see. But this man, who was asleep, says to the wind and the sea, “Peace, be still,” and the waters become perfectly calm again. The same Jesus who was sleeping in the back of the boat rebuked the wind and the waves and brought peace to the sea. The disciples marveled. Who could this be? Who controls nature, but the God who created it? Who is this Jesus who appears to be so weak? He is the almighty God by whose word the universe holds together. What harm can come to us when we are with Jesus? If we have Jesus we have God. God governs all things. He governs all things for the sake of his church. We are not our own saviors. Jesus is our Savior. Now this seems so simple, but we of little faith make it complicated. That Jesus saved the disciples from being drowned in the Sea of Galilee is obvious. That Jesus saves us from suffering for our sins should be just as obvious. He saves us body and soul. When our faith rests in Jesus we are free to love our neighbor. When our faith doesn’t rest in Jesus, we must see to our salvation ourselves. This is why religious people make up rules to obey that they trust will lead them into the good graces of God. They don’t trust in the Savior Jesus, so they must make their own savior. They become their own savior and their good deeds are the path of salvation. Faith and love go together. Only when our faith rests in Christ are we free to love. If we don’t know and believe that for Christ’s sake all our sins are forgiven, that we are at peace with God, that heaven is our home, and that no power in this world can separate us from God’s love, we do not have confidence in God. Without confidence in God we are thrust back onto ourselves. Without the assurance that being with Jesus is all we need no matter what difficultly in life we may face, we will look to our own good deeds and depend on them for our security with God instead of on Jesus. The good works we do will not be for our neighbor. They will not be for love. We will be doing them for us, not for others, for our benefit, not for the benefit of our neighbor. Faith and love go together. Faith sees in Jesus God’s answer to every threat to body and soul. Jesus taught us to pray: deliver us from evil. For Christ’s sake, our Father in heaven delivers us from every evil of body and soul. Faith rests in Jesus. It doesn’t seek to do what it cannot do. It trusts in Jesus to do it. Love is the fruit of faith. It doesn’t rest. It is active. It does not seek its own. It seeks the welfare of the neighbor. It doesn’t make up its own notion of love, as if God hadn’t already told us what love entailed when he gave Moses the Ten Commandments on Mount Sinai. Love considers the commandments against adultery, murder, stealing, false witness, and coveting, and doesn’t see the ladder for its own success, but how to love the neighbor in need. Faith is not formed by our love. It is formed by God’s love. That love was revealed on Calvary where Jesus faced all our fears by bearing all our sin. That love is given to us when we are with Jesus. He gives it in the gospel and sacraments. God’s love forms our faith. Then our faith forms our love. We love him who loved us. We learn from him to love our neighbor. Dynamically connect sustainable method	adjustments.